As written previously: There are performance benefits to be had by switching from VirtualBox to KVM. And now, after making the switch I can firmly say that not only are the performance benefits noticeable, the configuration of automatic startup and, prima facie, backups, seems to be much easier to establish and use. more of a prosumer product rather than an enterprise one, it’s only fair that I learn how to use it’s bigger brother KVM. Stop and backup all the virtualbox VMs. Convert the virtual disks from a virtualbox to kvm format. Create the virtual machines using virt- manager. 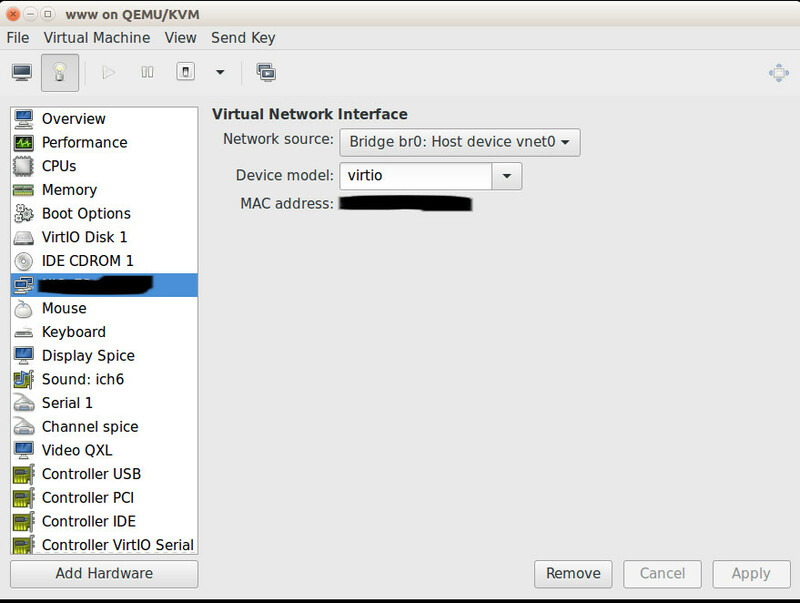 Set each of the virtual machines to use the new bridge interface to connect to the internet and local network. Configure each VM’s network interface to use the new network interface. Stopping the machines was easy, simply ssh into them and run shutdown -h now. Backup the machines using the clone option in VirtualBox. Thanks to this website for the useful tip. At this point I moved each of my VM disks to a new separate directory. This wasn’t strictly necessary, it’s just neater! This was testing and working. As my virtual machines are all running Ubuntu 16.04 the network interfaces file needed to be updated as the interface name changes after a hardware change. Finally, I uninstalled Virtualbox, removed vboxtool (which I had been using to automatically start the Virtualbox VMs), removed vboxtool’s config from /etc/ and restarted everything to test. Very happy to say it’s been quite a success! This week my wife asked me to create for her a blog. As such I’ve had to rejig the www server to make space for her new domain. Create the new user on the www server so she has sftp access. Create a mailbox, and mysql database for the new user. Create the directory structure, copy the latest wordpress to it and set file permissions. Copy and edit my blog’s apache config files. Depending on your setup, create a new mailbox, if you like and create a new database and user. I use phpmyadmin and postfixadmin for these tasks. Remember to note down the passwords and make them secure! Use a random password generator if needs must. WordPress (as www-data) will need write permissions on the sub directories particularly in the data directories to allow for downloading plugins and themes. Be sure to chmod g+w those directories. At this point, if you have not done so already, create the DNS entries for your site. For me this meant updating my internal DNS records with a CNAME for bel.warbel.net to point to www.warbel.net, which I replicated on my own DNS hosts: https://www.noip.com/ who I recommend. As I do not have a static IP address, I use their dyndns services on my router. 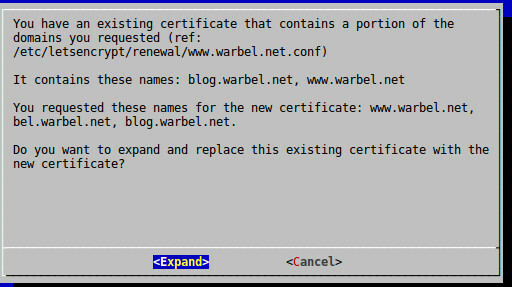 Next, I copied the /etc/apache2/sites-available/blog.warbel.net.conf and blog.warbel.net-le-ssl.conf and renamed them to bel.warbel.net.conf and bel.warbel.net-le-ssl.conf respectively. The let’s encrypt program will, initially, not expect to see a SSL site, so I commented out the redirects in the non-ssl file and updated the config file for all the references to the hostname and root directories. Be sure to edit the non-ssl site’s config and re-enable forced ssl. After doing some much needed research into virtualisation on Linux, it’s become apparent that I should migrate my virtual machines from Virtualbox to KVM. KVM has significant performance benefits and it is a solid ‘production’ system. It’s also clear that if I want to advance my technical skills in the enterprise Linux space, then I need to learn more about KVM and implement it on my systems. I love Virtualbox because it is cross platform- I can create a VM on a Linux host, and move it to a windows host if needed. The remote desktop server built into the program, too, is a very handy feature. However I will admit, that I very rarely will spin up a VM on Linux and move it to another OS (if ever) and since discovering MobaXTerm on windows, I can now easily, from any windows machine (read: my laptops) access the virt-manager X window session of a running VM on KVM. As an aside, MobaXTerm is an amazing program and compliments putty quite nicely! I need to convert the disk images into a native format for KVM and virt-manager to use. I currently automate my VM startup and shutdown with VBoxTool so I will need to either find a preexisting automation solution, or create my own init scripts. Virtualised hardware: Clearly Virtualbox and KVM will virtualise hardware in their own ways, so I need to be sure that the machines can migrate to the new environment and still work. I’m mostly concerned with networking as experience has taught me that Linux is very forgiving of hardware changes, however with the new naming conventions of Ethernet devices, my network configs will need to be updated. A small project this weekend. I used my hitherto untouched Raspberry Pi 2 as a security system. The process is reasonably straight forward to anyone who is already familiar with the Raspberry Pi. I have two web cams which are attached to the Pi via an external powered usb hub. This is necessary as the device does not have enough power to run itself and the cameras. It also has a USB 2.4G wireless dongle. Once the device was setup using the wired network, it could be secured with an admin password, by default it has no password and it can be added to the wireless network. All of the settings can be accessed by clicking the menu icon in the top left hand corner, and the process is intuitive, as is adding the cameras. I had tried to ssh into the device to make the changes, however the file system is set to RO by default, so I ended up removing the microSD card and editing the files on my desktop.